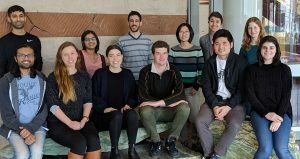 The purpose of Biology Graduate Student Council (BGSC) is to represent the views of the graduate students in the MIT Department of Biology. We present the questions, concerns, and general thoughts of graduate students to the Graduate Student Committee and facilitate productive conversations to seek appropriate changes when necessary. The BGSC also works to maintain and improve the quality of life of graduate students, facilitate professional development, and promote a strong sense of community within the Department of Biology through social events, networking opportunities, and outreach. Monthly Social Hours: Every month BGSC hosts a casual gathering of biograds to catch up with friends, meet new ones, and de-stress. Networking Workshops: BGSC puts on informative panels with advice for best practices when networking, followed by networking events that include professionals from the Cambridge/Boston area. BGSC Colloquium: BGSC choses diverse speakers who can share both their science and experiences with students at the Tuesday Biology Colloquium. BGSC connects the speaker to students by putting on a number of events during the day, including a discussion panel and a social hour. Annual Retreat: BGSC organizes an annual retreat where biograds can share their work and learn about what research is being done in the department. The retreat also includes a workshop to aid students in their professional development. Check our Facebook page for the most up-to-date schedule of events. If you would like to get involved with BGSC, suggest an issue for us to take on, or have an idea that would improve student life, follow us on Facebook or email us for more information!